Safety Is Our Number-One Priority. 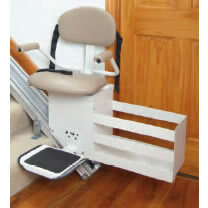 Our Rubex Battery Powered Stair Lift includes many safety features. The footrest has built in sensors that can detect objects on the stairs. The seat belt has a locking mechanism and the motor can instantly be reversed if needed. There is also a sensor that only permits the stairlift to be operated when the swivel seat is locked into the correct position. Limits at either end of the track and electrical slack cable safety devices make our Battery Powered Stair Lift one of the safest on the market. It meets ASME A17.1 and A18 safety standards for both private and public use. This stair lift is also ETL listed. 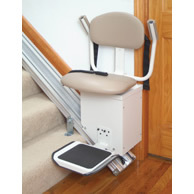 Included with the stairlift are two call stations that can be mounted on the top and bottom landing. Read more about AmeriGlide safety standards and certifications. Installation Is a Breeze. 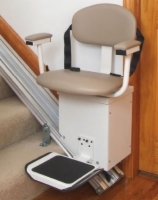 Your AmeriGlide Rubex battery powered stairlift is factory prepared for easy self-installation. No special tools or skills are required! You can install it on either the right-hand or left-hand side of your staircase; you can even switch it from side to side without any additional parts. Because the track is factory-cut to fit your stairs, it connects directly to your stairtreads—not the wall. That means no unsightly structural work! Sleek, Compact Design. Since space is at a premium, the seat and footrest of our Rubex Battery Powered Stair Lift can be folded up when not in use. When folded, this stair chair only takes up 14 inches of space, so others will still be able to safely use the stairs if needed. 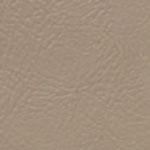 With a very elegant almond finish and a choice of vinyl seat color, this stairlift will compliment any home. We're here to help! Contact one of our stairlift experts to ask any questions or to find out more about how the battery powered stairlift fits your life. Note: capacity is reduced to 250 pounds if track length is 16 feet or longer. Unit Footprint, In Use 24.25"